So what do you do when a big group of clients cancels a guide trip at the last minute? What else, you go fly fishing. Unfortunately this is simply a fact of life in the fly fishing guide business and usually the reason for a client cancellation is legitimate. Additionally, our policy is that if we think the water, or weather conditions, almost guarantee poor fly fishing, or more importantly if we think conditions are actually unsafe we contact our clients and give them the option to cancel the trip. Hopefully they will rebook at a later date. This group missed a pretty good trip and hopefully they will come back and fish with us. Anyway, George Born, RyanBurks and Bo decided not to pass a good weather day and we all took off in our jet boat, Stinger Jane II. The Little Red River was a little high from all the melting sleet and snow but the water was really a beautiful glacial green from filtering through the area limestone. The guys started with some streamers and Bo’s new ACC Streamer quickly got hooked up to a nice slot Rainbow. 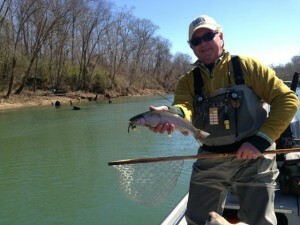 As the sun got higher in the sky the switch was made to nymph rigs and a #14 Chronic was definitely the fly of the day. The boys did not catch big numbers but they did catch really nice fish like the Brown Trout Ryan took on a Chronic Sowbug. 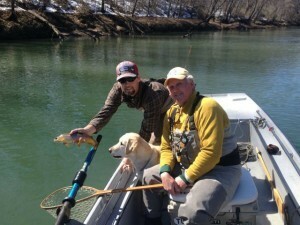 It was a great day for guides to fish and the day was topped off with some Elk Salami and a couple of ice cold beers. We have a lot of rain in the forecast for this week so we will have to see if March keeps comping in like a lion. Hopefully we will get a little better weather and start to see the March Brown hatch take off on the lower river.